So, you’re thinking of investing in property? Brilliant! Property is one of the safest investments you can make and, if you go about it the right way, it can be as easy as you want it to be! Download our free eBook to get started. Investing in your own slice of the property market pie can be a piece of cake! When done right, property investment can offer some amazing financial benefits and, compared to other investment types, it comes with much lower overall risk. At The Heaton Group, we love property (obviously!). So, we want to let you in on some of strategies that can help make your investment as successful and easy as possible. Jump on the back of our 45 years of experience in the property industry and learn how to ensure your next investment is a successful one. Complete the short form below, hit ‘Submit’ and receive your free eBook. We discuss the strength of the UK property market in 2018 and exactly which regions offer the most exciting opportunities for investors. 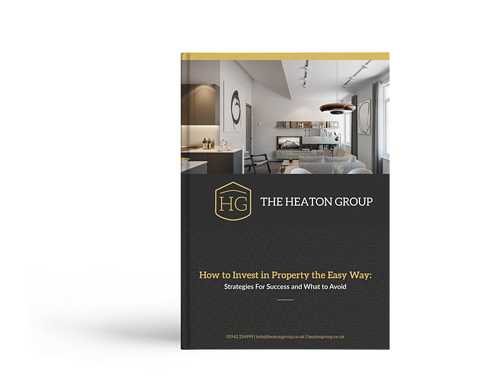 We share the strategies you need to use when investing in your next property and show you how to make the whole process simple and cost-effective. We let you in on what you should be avoiding when considering your investment so you don’t fall into any pitfalls. Compared to other investment types, property has always been seen as a safe investment with low levels of volatility and a steady return on investment. You’ll be receiving regular rental payments from your property as monthly income. However, you are also able to sell the property at any time for a further profit. Investing in property is a great opportunity to develop a diverse portfolio. You are also able to make improvements on your property at any time.